I read something today that made me stop and re-read it. It really hit a nerve with me! It’s something that any Paruretic should remind themselves of each and every day. If you want to succeed, to achieve your goals in life, you’ll need to push yourself beyond your limits. You’ll have to take yourself into uncomfortable territory… Where fear resides! See, staying “comfortable” with oneself, is staying “safe“, which means, avoiding the issue. Staying in your seat versus getting up to go to the bathroom is saying to yourself “I feel good staying right here, I can hold my urine for another 2 hours… no problem!” This is staying comfortable. Not wanting the discomfort of having to act! And that, is the root of all Evil! 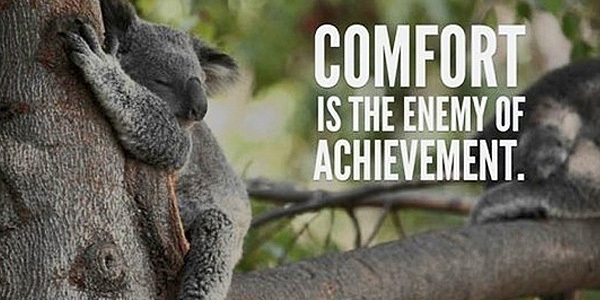 Because no one wants to ADD discomfort to your life… BUT YOU MUST! If you want to truly overcome this scared feeling. This uneasiness. This trepidation of Peeing in front of guys in a busy bathroom… Then you MUST face that demon every chance you get. You MUST keep trying until it becomes second nature to you. You can’t let your shyness manipulate your future! You can’t be comfortable. You won’t make progress that way. You must feel the nervousness and confront it! Only then will you surpass those issues and make them fade away, dissolve into the past. So if it feels okay, or good, and you’re fine with that… Then you’re really never recovering like you should. You’re taking a back seat to your Paruresis. So all those times when I still sit there in the restaurant and DON’T go to the john because “I don’t have an urge”, “I don’t really have to go”, “I can hold it”, “I didn’t Fluid Load”, then it AVOIDS it once again. Those are the times where I need to push myself even more. Force myself no matter what. Don’t listen to the Paruresis talking… Just do it! Even if I don’t have an urge to pee, I should still enter the bathroom. Keep desensitizing. Keep facing reality! I don’t care if I think I’ll fail, if I think I won’t be able to pee… Because that in itself is making you fail. But if you get up and go anyway, pee or not, you’re still forcing yourself out of your comfort zone and into recovery. I need to work more on this! To Try! To attempt to stand there at the Urinal every chance I can, just to squash those fearful moments. To let my anxiety calm down. To relax. To breath. Too see that there’s nothing to be scared of. It’s all in my head! I may not have to pee, but I can pretend. And maybe then I will pee. Who knows? I could surprise myself. But as long as I avoid it, I’ll never know, and my Shy Bladder WINS! It’s a Problem I face every day! It’s comfort. It’s tough to make yourself step over your boundaries. But you need to push yourself. It’s hard. You won’t like it. You’ll want to fight it every step of the way. After all, you’ll have to go where you don’t want to go! But “Comfort” really means “Fail“, and that’s something you don’t want!